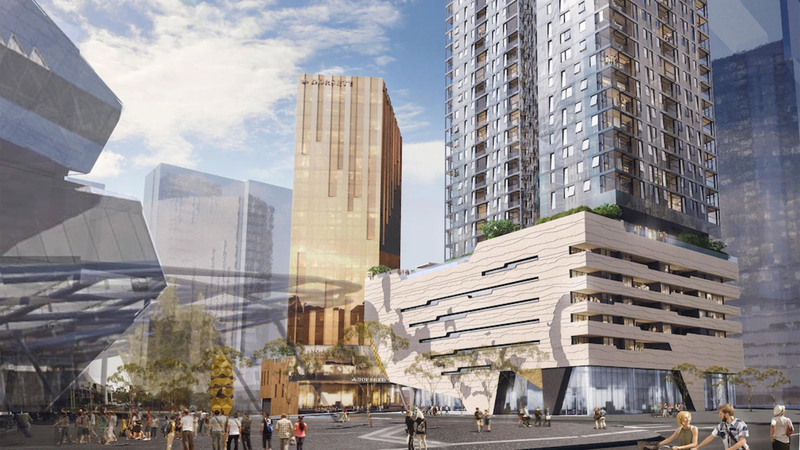 A $158 million, two-building hotel and apartment proposal put forward by Ritz-Carlton developer Far East Consortium was yesterday expected to be approved by a planning subcommittee that reports to the Metropolitan Redevelopment Authority board. If it does win board approval, work on the hotel and apartment development mooted for Perth City Link lots 2 and 3A could start this year. The drawn-out process started when Far East Consortium stepped up in late 2016 after Thai developer Minor Group in 2015 walked away from the city link project after a design dispute. Far East Consortium’s $220 million plan for a 250-room Dorsett Hotel and 350-apartment tower was rejected last year, forcing it back to the drawing board. Its reworked plans, which have again been modified to take into account design and other stakeholder concerns, were yesterday to be considered by the MRA planning subcommittee. The latest plans are for a 263-room, 23-storey hotel and a 32-storey tower with 314 apartments. The agenda notes say the planning subcommittee was to vote on a recommendation that the MRA board approve the latest plans subject to conditions. The Minister for Planning makes the final determination. The agenda notes the MRA’s design review panel, which considered the latest plans last month, “considers that the proposal generally demonstrates design excellence”, drawing on “the organic nature of Yagan Square to the east and the geometric form of Perth Arena to the west”. The sticking points, to be dealt with as conditions of the approval, include providing affordable housing (37 of the 314 apartments), which may not have access to all bonus services to ensure lower continuing strata fees, and the resolution of “private open space” or balconies with a tension between noise reduction to be resolved by replacing fixed windows with lift and tilt-operable windows for winter gardens/balconies. The MRA’s planning subcommittee recommendation to approve the project was based on its conclusion that Far East Consortium’s plan would support “the creation of a multi-functional, vibrant and active environment that embraces Perth’s lifestyle and character”. “The proposal will facilitate critical population mass to support the nearby Kings Square buildings and Yagan Square,” it said.